On August 24 and 26, 2015, the Department of Art Research, Archives and Information Systems conducted high-resolution color and near-infrared photography surveys on seven paintings of Eminent Priests that are part of National Treasure Prince Shōtoku and Eminent Tendai Priests (a total of 10 paintings possessed by Ichijō-ji temple in Hyogo Prefecture) using the digital imaging technology of the National Research Institute for Cultural Properties. The seven paintings investigated in the latest surveys are currently deposited with the Nara National Museum. 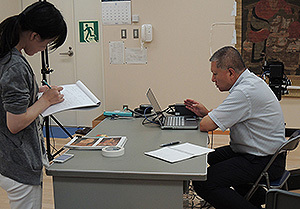 Seiji Shirono, Mai Sarai and Tatsuro Kobayashi took part in the survey conducted at the museum. Together with the images we had already obtained so far, the findings of the latest surveys include more detailed information of the paintings than ever, and we are preparing to publish the outcomes of the research project.